The Tommies start their play-off push Thursday night vs. Moncton. All games will be broadcast on SSN Canada. 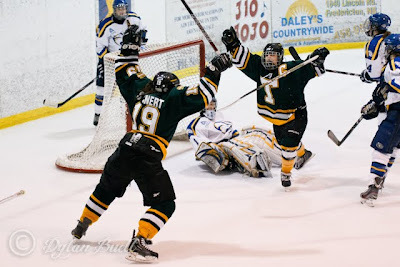 Caley Steinert and Kayla Blackmore celebrate the final goal in STU Tommies LBR Hockey history. THE LADY TOMMIES DID IT!! 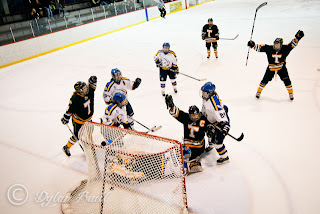 In the final game at the LBR for STU Hockey the Ladies defeated the UdeM Aigles Bleues 2 to 1 in overtime. Caley Steinert with a brilliant end to end rush closed down STU's time at the LBR in exciting fashion. Julia Sharun was phenomenal in the STU goal. Kayla Blackmore ties the game for STU. The first two periods were scoreless in this tight match. Neither Moncton nor St. Thomas were willing to blink and both goaltenders did their part in keeping the game tied at zeroes. Shots after two periods favoured UdM 20 to 17. Moncton received an early powerplay in the third when Paige MacDonald was sent to the box for tripping and M-P Arseneault scored seven seconds later at 0:27 to give Les Aigles the 1 - 0 lead. Things looked grim but the Tommies were not going to have their night end with a loss. You could see the fight in every stride, every move. The crowd was anxious for a Tommies goal and Kayla Blackmore (Scott, J. Miller) delivered at 7:59 to tie the game and reenergize the Tommies faithful. U de M had a breakaway with less than 2 minutes to play but Julia Sharun was up to the task and shut the door to force overtime. You could feel the electricity in the final overtime at the LBR and we didn't wait long for an amazing rush to finish the game with a victory for STU. Caley Steinert just about to end the LBR days in style. The Tommies clinch 5th spot in the AUS and will head to Halifax on Sunday to play their final game of the regular season versus Dalhousie. THANK YOU LADIES, YOU MADE ALL OF US VERY PROUD!! CALEY STEINERT with the final goal for STU at the LBR!! IT'S GOOD, TOMMIES WIN - TOMMIES WIN!! The Tommies dropped a 3 to 1 decision this afternoon to the St-FX X-Women in Antigonish. Danielle Miller from Brewster and Blackmore scored STU's lone goal at 13:34 of the second period on the powerplay. X held period leads of 2 to 0 after one, 3 to 1 after two. There were no goals scored in the third. The Tommies had 9 chances on the PP and only converted once. Julia Sharun was solid in the STU net. Shots were 29 - 26 for X. With the loss and Dalhousie's surprising late comeback win over Moncton this afternoon, the Tommies find themselves tied with the Tigers for 5th in the standings but have two games in hand. STU heads to Halifax for a 2 PM start against the SMU Huskies tomorrow. No webcast is available for this game. 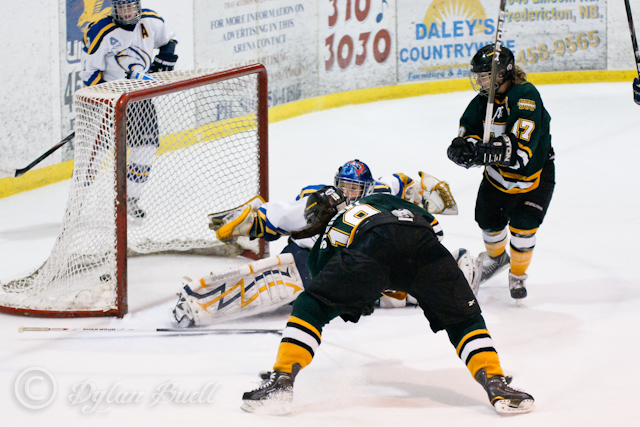 Kayla Blackmore whacks home STU's only goal. Although the Tommies outshot the Mounties and arguably held much of the play, they came out on the wrong side of a 4 to 1 decision to Mount Allison. Turnabout is fair play, as STU defeated Mt. A a few weeks ago by the same score in their barn. 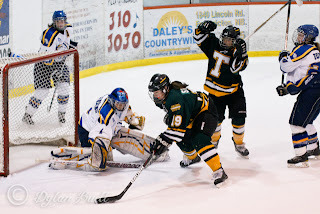 This afternoon Kayla Blackmore (D. Miller, J. Miller) scored the lone goal for the Tommies at 14:05 of the first. The Mounties would score three in the 2nd period and one late in the third to secure the victory. Shots were 37 to 30 for STU, as Julia Sharun was tagged with the loss. 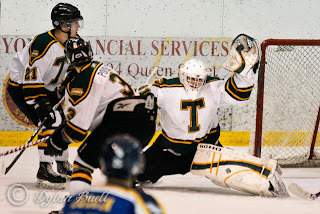 The Tommies hit the road next weekend and face off against Saint Mary’s and St-FX before returning to the LBR for their final game against Moncton on the 24th. 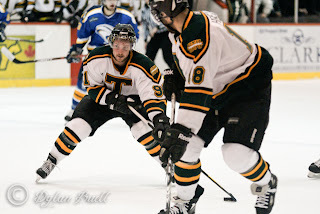 In AUS men's hockey action at Summerside this afternoon the UPEI Panthers scored 3 PP goals to defeat the Tommies 5-0. The game was part of the Hockey Day in Canada celebrations, although the Tommies had little to celebrate. The Panthers scored two in the 1st and three in the 3rd while out shooting the Tommies 31-29. Justin Collier played 32:28 allowing 2 goals with Charles Lavigne going the final 27:32. And so another Tommies season has come to an end and although we failed to make the play-offs for the 4th year in a row, we did witness improvement in a number of areas which gives us great hope for the coming years. 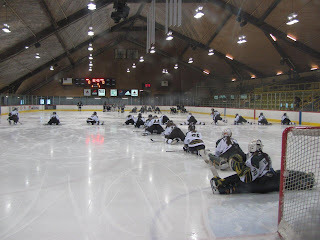 This year's team has made us believers once again and by their on ice play a determined desire to turn this program around....and so congratulations to the coaching staff and players for a job well done.....we look forward to the 2012-13 season with great anticipation. We wish to express our sincere thanks to each of our guys for a super season and in particular to our graduating Tommies (Charles Lavigne, Brad Gallant, Bryan Main, Jordan Scott & Andrew Andricopoulos) for their outstanding & exceptional contributions to Tommies Hockey. 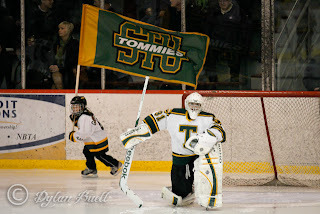 We wish each of them all the best in your future endeavours....."Once a Tommie, always a Tommie"
during action against UNB last night. Come with us as we turn back the clock to February 12th, 2011. Imagine, as the Tommies leave the LBR ice following a 6-3 loss to St. F-X, that we told you the Tommies would still be in the playoff hunt with 3 games to play this season. You might call us crazy. If you're a Tommies fan, you'd certainly be pleased at the possibility. Sure enough, that is the position in which St. Thomas found itself tonight, entering Game #26 against the hated Squirrels. Unfortunately, the Squirrels won 5-0, officially eliminating the Tommies from contention. Charles Lavigne was valiant in goal, facing 46 shots. Now, it's not all wine, roses and puppy dogs by any stretch. 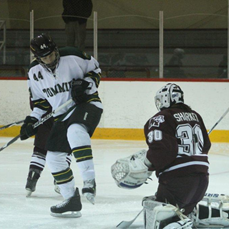 The Tommies have 5 wins on the season, just two more than last year, with 2 games to play. A major reason STU was still in the hunt so late was thanks to St. F-X's underwhelming season. But we were in the hunt nonetheless. And there's one thing around this team that wasn't necessarily there one year ago. Hope. We've seen good reason for it. Coach Troy Ryan has instilled a new culture. Fine rookie performances from the likes of Stephen Sanza, Felix Poulin and Jonathan Bonneau. Improved team discipline. A brand new, state of the art building is coming. There is hope, Tommie Nation. This season is not yet over. The Tommies still have two games to go this weekend, including one as big as any this Friday night against Moncton, as the Tommies Men will say farewell to the LBR, those hard bench seats, its sometimes insufficient heat, the Great White Wall, Rum Row, and years and years of wonderful memories. If there is one game you attend this season, make it Friday night. Let's pack that old barn and say goodbye by cheering our Tommies on to one final victory. And keep the hope alive. If you missed the final matchup of STU vs. ST-FX at the old LBR, well sorry for you, because you missed a dandy. Tonight's game had a little of everything - scoring, hat tricks, penalty shots, and rough stuff - with STU coming out on top 6 to 3. The X-Men and Tommies were both desperate for a win tonight and their play showed it. STU was on the board first at 3:56 when Steve Sanza (Cameron, Bonneau) hammered home a one-timer to get the game rolling. X replied late in the first when Brennan Wray just barely snuck one by Charles Lavigne in the STU net. Period ended tied at 1's. Jordan Scott (Poulin, Cheremetiev) scored on a rebound, as the Tommies retook the lead at 5:21 of the second, but X replied on the powerplay to tie the game again at 11:20. It stayed that way heading to the third when things would get interesting. With the playoffs on the line the Tommies came out hard in the final period. Andrew Andricopoulos (Poulin, Sanza) fired a laser beam from just inside the blueline to retake the lead. Jonathan Bonneau (Sanza, Poulin) would stretch the lead at 8:27 when he rushed down the left wing side and fired a shot that Joseph Perricone bobbled right into the net. St-FX replied back a minute and five seconds later to make the score close again at 4 to 3 but Jonathan Bonneau (Cameron, Van Laren) gobbled up a greasy rebound on a 2 on 1 with Randy Cameron to regain the two goal cushion. The fun really started at 15:39 as Jonathan Bonneau was awarded a penalty shot. Bonneau would deposit the puck five hole for the hat trick and a three goal lead. This seemed to be the trigger as X brought the dirt shortly after. With 2:25 to go in the game Chris Morehouse found himself in front of Perricone, who immediately took exception to his presence, and started swinging. 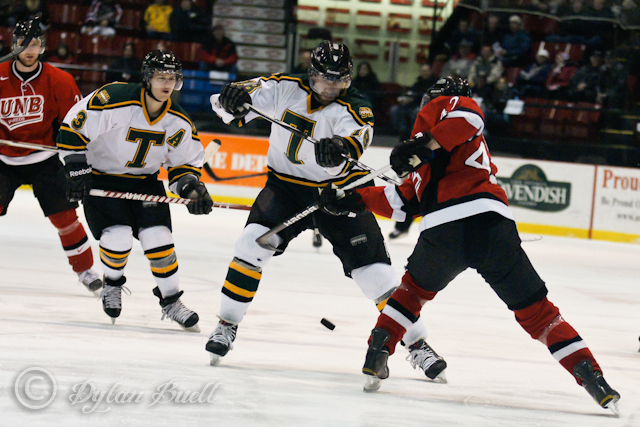 After 70 minutes of penalties were handed out, none for fighting, the Tommies were awarded a powerplay. The peace was short lived as Scott Brannon ran Jordan Scott over and Andrew Andricopoulos, who isn't known for his fighting presence, immediately stepped up to defend his teammate. Not long after Kyell Henegan came in for a piece of the action as well. All of this took place at 18:07 and another 43 minutes of penalties were handed out. STU had a two man PP for most of the last 1:53. Troy Ryan called a time out, settled the troops, and must have told them to play out the third without embarrasing the X-Men, as STU didn't even attempt to shoot the puck on net. With the win the Tommies sweep the season series with X and pull four points back of them for the final playoff spot in the AUS. It really was a less than stellar showing for St-FX and their disappointment/frustration got the better of them tonight. Lets leave it at that.